I'd like to share an activity that has worked very well with a group of my 15-year-old students. These kids become amazingly creative if their interest is incited. At this age they enjoy playing various PC games (Warcraft, Dota 2, Minecraft, etc.) and reading fantasy books with lots of superheroes and supernatural powers and abilities. So I thought I could turn this to my advantage. In the previous lesson we had focused on past tenses and I wanted my students to get more practice. As a warm-up activity, I asked each student to take down 5 verbs, 5 nouns, 3 characters (superheroes, people, animals), and 3 places. 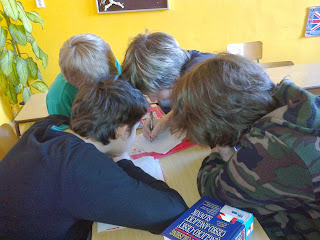 Then I put the students in groups of four, so each group ended up with 20 verbs, 20 nouns, 12, characters, and 12 places. Now their task was to agree on 5,5,3,3 by the process of elimination. They weren't allowed to speak Czech at this stage. At this point I revealed that they were going to write a story using these words. I didn't want to tell them in advance because it would have influenced the choice of the words dramatically. Each group then got a large piece of paper. They immediately started whispering and sharing ideas related to their story when I stopped them and got the groups to swap their lists of words. So each group had to write a story using somebody else's words. Although this makes the task more challenging for the students, I believe it also makes it more interesting; the group that has provided the words will be more interested in reading the story the other group has invented because they will be curious to see what their peers have done with their cues. And that is one of the objectives: students should be encouraged to read each other's stories and give feedback. Finally, I collected the stories since the main grammatical focus was the past simple vs. past continuous contrast and I wanted to make sure that they could use the tenses correctly. As it is challenging to create a story and our students are not professional writers, we need to provide them with a lot of help and scaffolding. I should stress that this particular activity was inspired by ideas and tips Gareth Davies shares in his creative writing workshops and on his blog. He believes that before writing a story, it's good to have a few things in mind, such as the characters and the scene. This makes the writing process easier because the writer has something concrete to elaborate on.